I've been getting questions about what I will be doing with all of the peppers we are growing. Like these jalapenos for example. We've got 4 plants which all seem to be pretty prolific. I love spciy food, so I planted them thinking I could just add them to our regular meals. Which I do... but there will be more and more peppers. That means I need some recipes (and if you have any, please pass them along!). We had a dip similar to this one at a local restaurant. And it was fabulous! Hope you try and enjoy it too! Heat whipping cream in a heavy saucepan over high heat. When the cream is ready to boil, stir in sour cream. After sour cream dissolves, reduce heat to medium. Stir in chicken base and simmer. Just before cream mixture is ready to boil again, add roux, whisking briskly and constantly until roux is incorporated. Remove from heat; stir in minced jalapeno and the cheese. 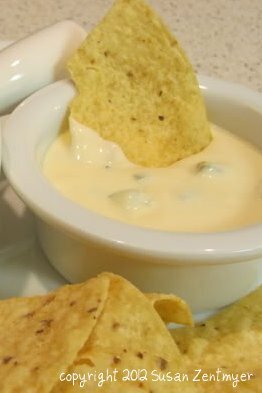 This dip is wonderful served with tortillas chips and I think it would be equally delicious with bread cubes, similar to how artichoke dip is served. The dip sounds yummy! When should I come over for some? However, also very pointy :-( Have you tried slimming it down yet? This sounds delicious! I just harvested a couple Jalapeno's yesterday and made Jalapeno cheese bread, but I will need lots more recipes for the coming months! Thanks for sharing!